A 59 year old Ruffin man, succumbed to traumatic injuries received in a single vehicle accident on Bells Highway at Stokes Road Friday morning 27-April at 09:50. The small pickup truck left the roadway, went down a small embankment before striking a power pole. Medic 26 found the man still in the vehicle when they arrived. Click here for additional information. 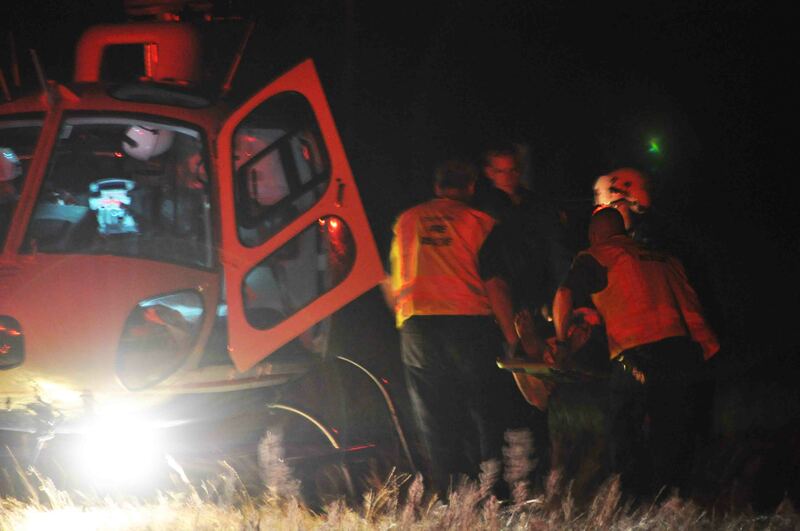 A 28 year old parachutist was air lifted to a Trauma Center following a hard landing Saturday afternoon, 21-April. The man was one of many people enjoying the sport during the air show at the Lowcountry Regional Airport’s Wings and Wheels Show. The man impacted the ground at a high rate of speed and received suspected internal injuries. Click here for additional information. 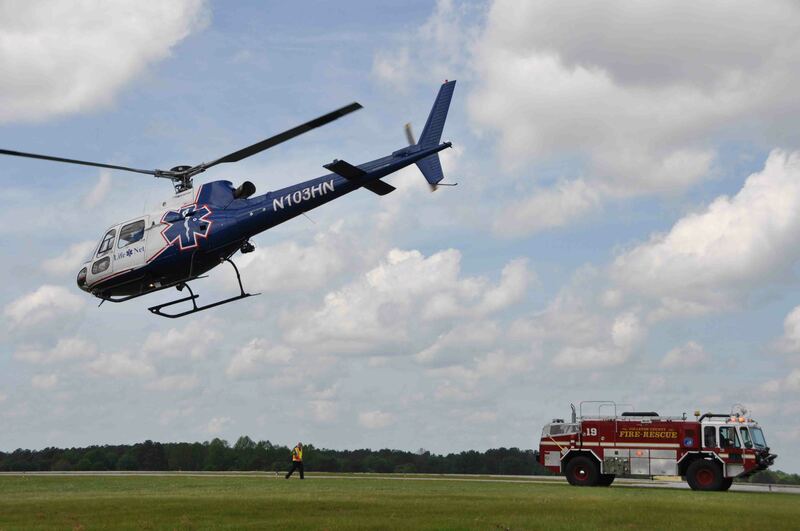 Fire-Rescue units participated in the annual Wings and Wheels Air Show at the Lowcountry Regional Airport, Saturday 21-April. 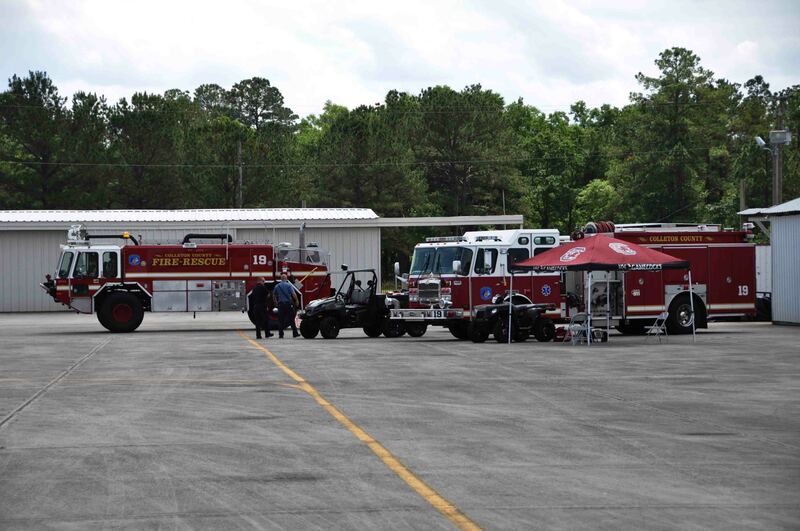 ARFF 19, Engine 19 , Medic 19, Battalion 1 and Car 111 stood by for the event and displayed the apparatus. The large crowd viewed antique automobiles, custom cars, new, experimental and vintage aircraft. Click here for additional information. The 1153-12-511, IFSAC Firefighter I course scheduled to start on 5/28/2012 being hosted by CCFR will be held. There is still some space in this class. The schedule is from 5/28 to 7/7 on Monday, Wednesday, and some Saturdays. The pre-requisites are course 1152/1131 (or equivalent), 2722 - Haz Mat Operations, and CPR/First Aid. If you are interested in taking this course, please complete a SCFA application and forward it to the training division. If you have any questions, please contact the training division (538-6849). Departmental Directives have been updated and hard copies will be distributed to each station over the next week. Click here to view a summary of the updates and the newest version. These files are also available from the Member's Only Page. 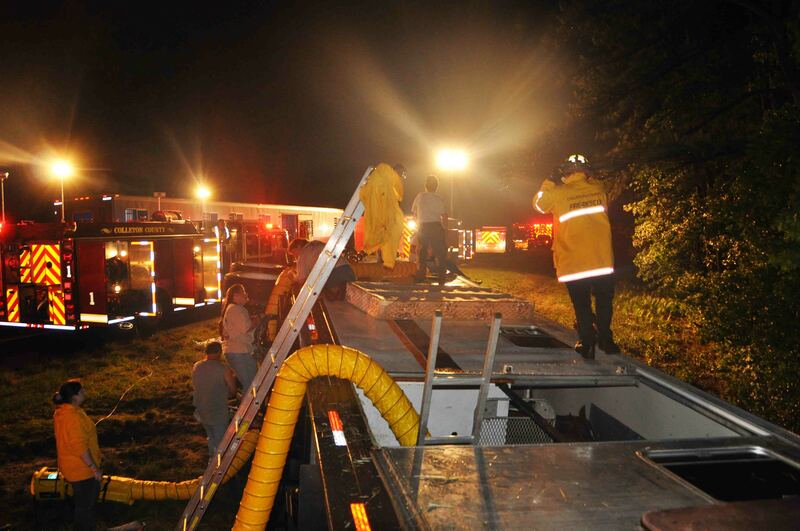 A severe thunderstorm was a contributing factor in a single vehicle crash that injured one man and trapped six race horses. 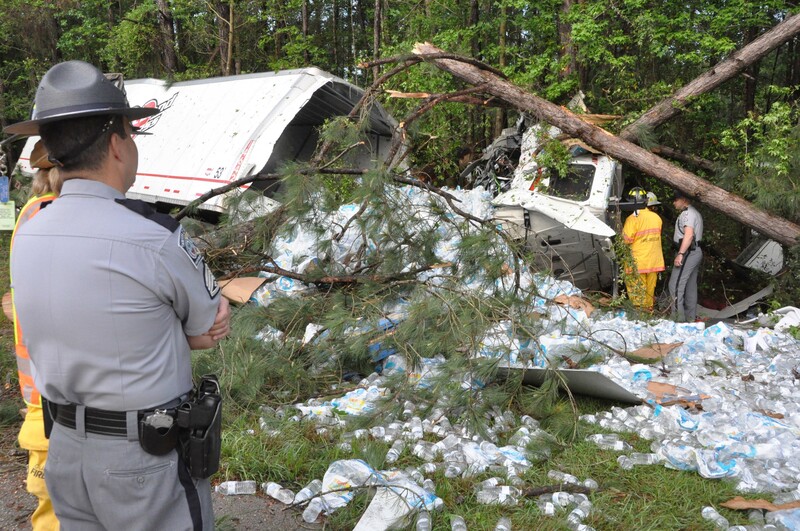 The accident occurred on Interstate 95 at the 43 mile marker northbound. The tractor trailer was traveling north when it left the roadway on the right shoulder, spun around backwards and turned over on its side at the wood line. Click here for additional information. Click here to view information regarding the Second Annual "Fallen Angels" Charity Golf Tournament. 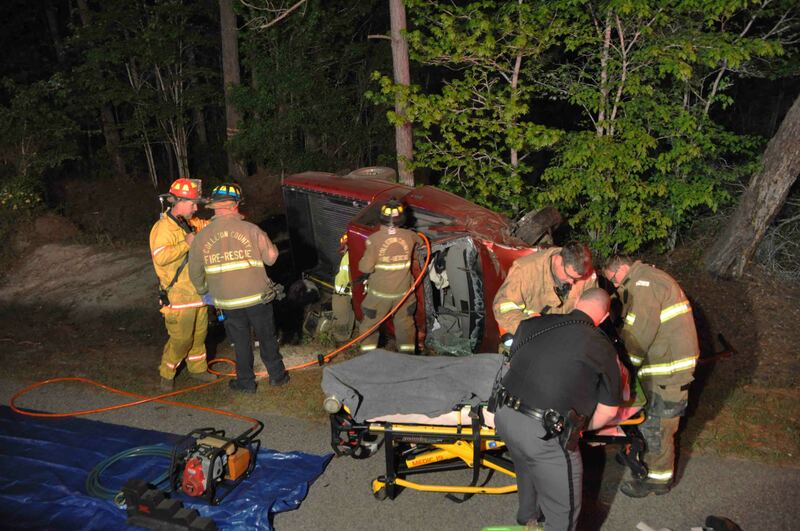 Two women were injured, one critically when their small pickup truck left the roadway, struck several trees then rolled over on its side. The accident was reported in the 6000 block of Pleasant Grove Road (approx. 1 mile west of Round O Road), Saturday morning 14-April at 05:06. One woman was trapped in the wreckage. It was believed that neither occupant was wearing a seatbelt. Click here for additional information. 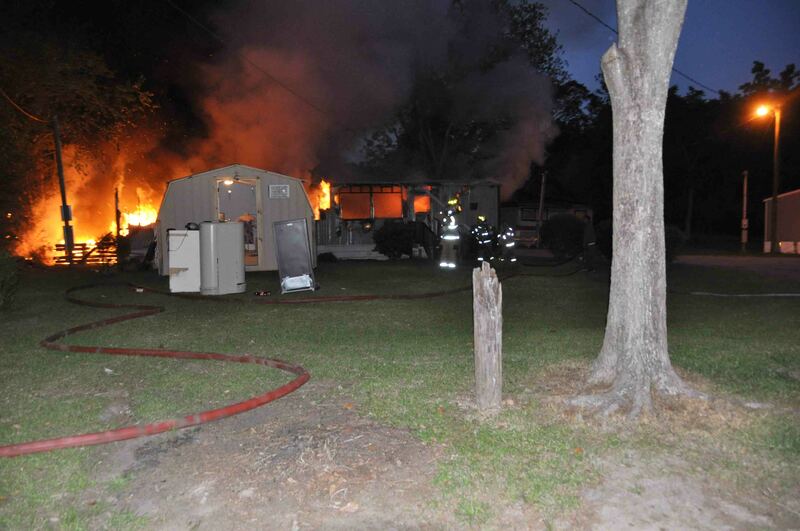 The mobile home located at 41 Raleigh Street in the Green Park Subdivision, burned for the second time in the last five weeks. Firefighters saved the home on 04-March, confining the fire to an exterior wall and the ceiling, with little interior damage. At 02:53, Friday morning 13-April, a motorist passing near the home on Gadsden Loop spotted flames coming from the structure. Click here for additional information. Two Colletonians completed Paramedic Training through Rescue Training in Savannah Georgia Wednesday 11-April. 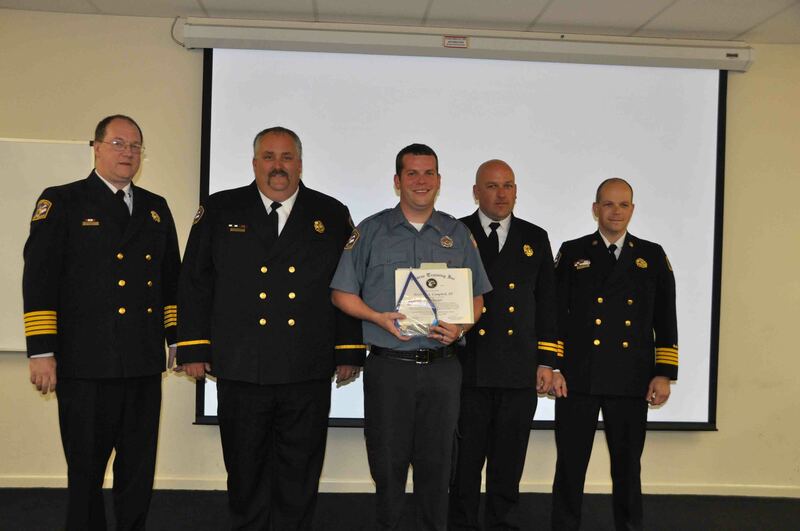 Fire-Rescue’s Firefighter-EMT Kenneth (KC) Campbell, III and local resident EMT Ashleigh Stone graduated from the year long course. The intense training course involves over 1500 hours of classroom and clinical training. Campbell won two honors...click here for more information. An early morning fire destroyed a workshop/storage building located behind the residence at 323 Sixth Street at 04:13, Wednesday 11-April. Battalion 1 arrived to find the approximately 12 x 24 foot wooden building fully involved. Engine 19 deployed one 1-3/4 handline to extinguish the fire. Crews had the fire under control within 10 minutes, but were on the scene for 1-1/2 hours...click here for more information. 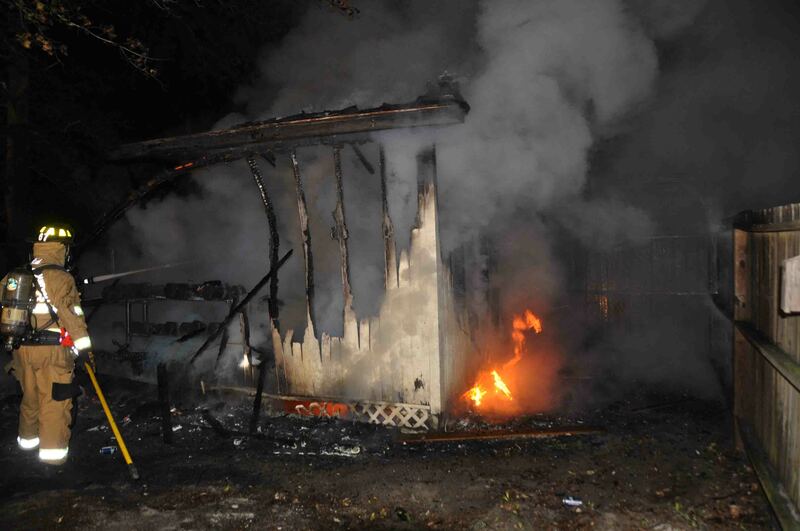 An electrical problem caused a fire that destroyed a Ferguson Lane home Monday evening 09-April. 9-1-1 Operators received a call from a juvenile at 39 Ferguson Lane at 19:39, stating there were sparks and smoke coming from the electrical panel in the rear bedroom. 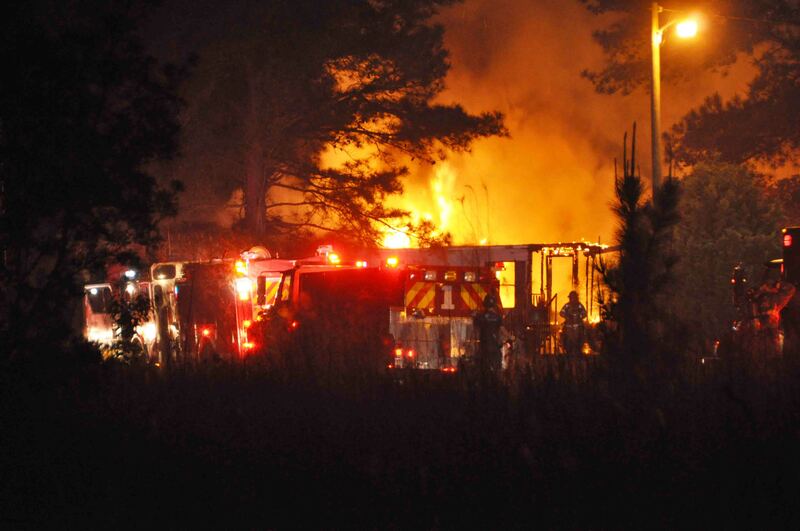 A firefighter in a brush truck returning from another assignment, arrived four minutes later to find the singlewide mobile home well involved...click here for additional information. A loaded tractor trailer crashed into the median on I-95 near the 62 mile marker northbound at 07:40, Thursday morning 5-April. The truck left the straight section of highway at a high rate of speed and struck multiple trees before coming to rest in the median. The force of the impact caused massive damage to the truck’s cab, heavily entrapping the driver. Click here for additional information. ATTENTION ALL CCFR PERSONNEL: CCFR has received state of the art, high technology Scott NXG7 SCBA's which will replace all the SCBA's currently in use throughout the entire fleet. Training on the new Scott NXG7 SCBA's will begin tomorrow, April 5th at 13:00 hours at Station 19. Eleven training sessions will be held throughout the county and all SCBA users are required to attend one session. If you have had an SCBA mask issued to you or have had a fit test completed during OSHA training, please make arrangements to attend one of these sessions. Click here for a full schedule of available Scott NXG7 SCBA training sessions. If you have any questions, please contact the training division or headquarters.